If you want, I can give a workshop. I'm not sure it's a consolation, but I have mastered the skill of being confused as a man, even though I didn't intend to. So men don't ignore me, but they think I'm a guy. And so do most women. 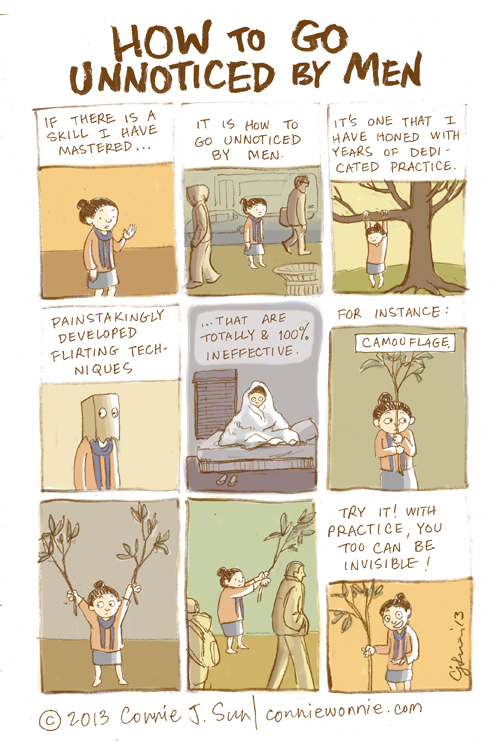 I have the same superpower, the only difference it's that I'm able to be invisible for both male and female. I'm starting to think maybe I should use this power for something bigger than me.... maybe free movies ._. So maybe men don't ignore you and instead you don't notice? You've got to have creepy dudes in NYC making lewd comments, so the decent ones aren't as obvious. I have no way of knowing, but maybe some of the guys who are nice to me are interested? Being a little socially awkward I think I miss these social Q's and only notice the goons. Anyways, it's possible. You're cute, looks like you dress nice, so doubtless guys are checking you out. Part of it is noticing and then knowing how the heck to respond.